A furnace tune-up is essential at this time of year if you want to keep your home protected during the upcoming winter. With the need for heat more urgent than ever, you are probably doing some heating maintenance if you want to ensure your 100% comfort in a season full of snow and sleet. However, there’s also a good chance you are not a licensed professional with the right tools and experience to get the job done. Each winter, there will be some homeowners out there who think they have a skill set like a pro, but they wind up making mistakes that will ultimately leave them without reliable heat. Failing to maintain home heating properly can lead to tons of problems this winter including increased spending on bills, shortened system lifespan, poor energy efficiency, and worst of all, a heightened risk of home heating fires. You may also find yourself having to replace your system much sooner than you expected, potentially costing you thousands of dollars in the process. Your winter shouldn’t be filled with so much stress. If you want to avoid these mistakes, it’s important to practice awareness and study up on what mistakes should be avoided at all costs. It can mean all the difference in how comfortably you live in your home this season. Fortunately, Outstanding will be available all winter to assist with any of your furnace needs. We don’t want to see any homeowner get stuck in the cold this season, especially if it’s because of their own doing. Our heating technicians are more than willing to lead you down the right path so your heating system avoids any trouble. We can provide an annual furnace tune-up that will closely inspect your heating system for any lingering problems and then fix them immediately. You can also ask us any questions you may have on your heating system, and you’ll be guaranteed to have a satisfactory answer. With our help, you will avoid higher spending on repair and utility bills, especially when you have a heating system delivering high-efficiency heat for years. You will also avoid safety risks like home heating fires and carbon monoxide exposure. Above all else, you will enjoy a better peace of mind throughout the season, ensuring this winter is your most comforting to date. Not Changing Furnace Filters: Filters should be changed once a month during the winter, as they will become clogged with dirt and debris. Refusal to do so will result in blocked air flow and force the system to work harder in producing heat, increasing energy costs in the process. Failure to Schedule Annual Maintenance: Not calling Outstanding for annual heating maintenance may leave small, hard-to-find problems within the system go unfixed and worsen to the point where the furnace breaks down. 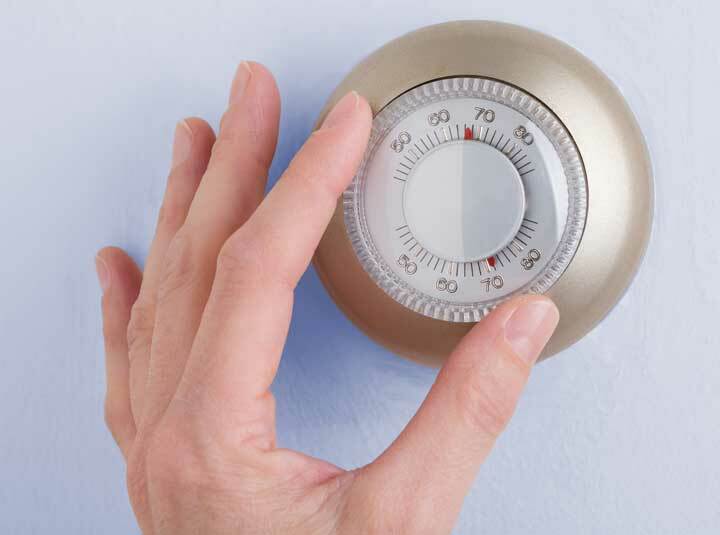 Setting the Thermostat Too High: If you set the thermostat too high, it will work non-stop to attempt to reach the temperature of the thermostat setting. Instead, choose to keep the thermostat on a normal setting and look at making other changes in your home to help your furnace run more efficiently, such as adding more insulation or covering exposed windows. Failing to Replace the Old System: Sometimes no amount of tune-up work will be enough and you will need to replace the furnace altogether. Please replace the furnace once it ages past 15 years. Though it can work well in its old age, you will be putting yourself at higher risk of increased spending due to lower efficiency and frequent system breakdowns. Buying the Most Cost-Efficient System: So let’s say you do seek furnace replacement. Homeowners will purchase the most cost-efficient system under the belief they can have high-quality heat at a lower cost. Unfortunately, cost-efficiency does not guarantee efficient performance. That cheap furnace may have a higher risk of breakdowns. Not Adjusting the Thermostat When Nobody is Home: You should definitely turn down your thermostat when nobody is home. After all, if nobody in your home is available to enjoy the heat, why waste energy? Not adjusting it can leave you in for an unpleasant surprise when the next energy bills arrives in the mail. Clutter Buildup in the Surrounding Area: Since the furnace is installed in the basement, you may notice the surrounding area is cluttered with personal belongings. This can be dangerous, especially since one spark from the system can set any nearby belongings on fire. To avoid the emergency, maintain a safe from the furnace for everyone and everything. Failure to Clean Furnace Components: Your furnace components will become overwhelmed with dirt, dust, and debris. Some homeowners will forget to clean them at all, which hurts system lifespan and efficiency. You should instead take a vacuum and cloth to the system to ensure it remains spotless. Disregarding the Warning Signs: Your furnace will give away indicators letting you know it’s time for a tune-up. Some homeowners won’t pay attention to them altogether, and wind up replacing their system sooner than they expected. Warning signs of furnace trouble include: odd furnace noises, unpleasant odors, significant physical damage, and higher costs of bills. Contact Outstanding today if you want to avoid high stress this winter by calling us for a high-quality furnace tune-up!